Do you ever have times when you run low on patience, or even hope? — when it seems you’ve been struggling with something long enough, and you feel the situation may never change? In this season, even though you know that the sun is returning, you don’t feel it. If anything, the days can seem colder and even more bleak. A Maori description of this season refers to ‘ruarua huangohingohi’ (few and withered), which is very apt. If anything, the days can seem colder and even more bleak. Someone said to me recently, ‘I hate the winter cold and just want to get away to the north and into the sun.’ Many who have done this have been shocked at the high temperatures of this year’s northern hemisphere summer. Out of the freezing pan and into the fire. But if you’ve stayed in your southern hemisphere home through the winter, you may be hanging on for the first glimmerings of a change. 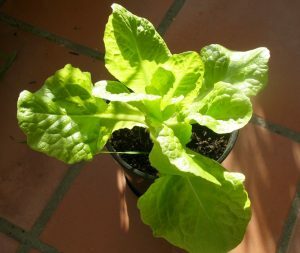 Just a few days ago I noticed that the lettuce seedlings I’d planted in pots suddenly seemed to have grown wings. They were unfurling with tender green into the light of morning. 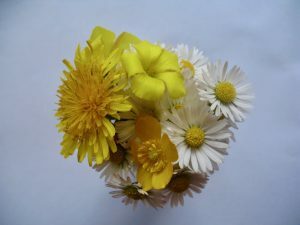 Today I walked in the park with my granddaughter and we returned with a posy of daisies, a buttercup, dandelions and dainty yellow wildflowers. One friend has a daphne bush sending out fragrance beside her front door. Another is delighting in the sight of daffodils on the Taranaki coast. Slowly, the earth is awakening. The earth worms are stirring. Buds are forming, even as wintry chills lash the branches. And what is awakening in you? What new hopes and intentions are preparing to unfurl? Nurture and protect them as carefully as you would protect a delicate seedling, because your dreams are precious and the winds are harsh. Let the sun warm them and coax them out of hiding, for First Light is here. This festival is easily overlooked. Because it holds a delicate energy of glimmerings rather than dramatic explosions, it can sometimes be a forgotten festival. But it’s one that I always anticipate eagerly. I’ve learned that every year without fail August 2 is when I actually feel the warmth that has been secretly returning since winter solstice. I know that from now on the energy of new life will gather and increase in a way that becomes noticeable. This feels like a relief and a cause for celebration, because I know that anything I initiate now will be supported by a gentle — and later enthusiastic — increase in life force. 1. Think of an action to send winter on its way, to throw it out the window. Maybe you could burn its effects on a fire, or crumple its unwelcome messages into the bin. Clean a window. Clear out a drawer. Sweep away cobwebs. 2. Watch for signs of new growth in nature. You may be surprised at what you discover. 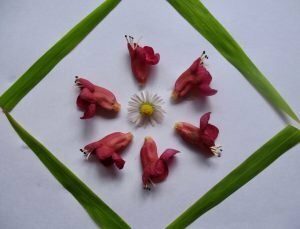 Collect new buds, bright leaves and first flowers and create an altar in honour of the shift towards spring. 4. Write on a small card or piece of paper your intention for the next phase, and place it on the altar. Light a white candle for new beginnings, and meditate quietly, seeing your intention being irradiated by the glimmering of First Light. May your dreams begin to stir into the light. Our lowest times are often a preparing of the way for something waiting to be born within us. 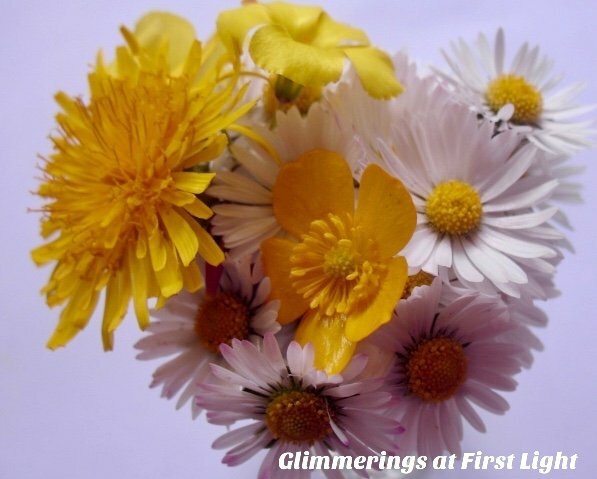 For more information about First Light, check out Celebrating the Southern Seasons or Dancing with the Seasons. This blog is an excerpt from my Seasons Newsletter. To receive the full Newsletter, you may sign up on the home page of this website and receive a free audio meditation. Thank you Penny, and I’m glad of your lovely week and that you enjoyed the quote. Hello Juliet. Your message about the end of winter being upon us, and signs of new light seem to be relevant. As you know, my mother passed away earlier this year. All autumn and into winter I processed the chaos of her death, and the practicalities of winding up her Estate. Today, I am very near the end. The proceeds of her Estate have come to me for distribution. Tomorrow, I will send my sisters their share of her Estate. It seems so uncannily insightful to have today’s monetary receipt and tomorrow’s plan to distribute my sister’s contribution at this shifting phase in the seasons. I can not help wondering how important and magical that might be. I am so looking forward to being out of the practicalities of winding up an Estate and getting on with other things that Estate space took up. And windows and cobwebs are a good idea. I can’t manage that tomorrow, but will endeavour to do something of it in the weekend. What is my longing at this time? Kindness and respect. I think they are two very important aspects of being human that I notice to short in some people at the moment. I feel the lack of kindness and respect painfully when it is absent in people’s intention. I consider it my task to make sure it is present in me to give to others. Denise,how perfect to be completing that big task of winding up your mother’s estate just as the season shifts. I wish you happy new beginnings at First Light, and may kindness and respect be with you. P.S. The posy is beautiful!. I love your posts and really look forward to reading them. I’m in the northern hemisphere and the heat has been brutal. I’m also looking forward to the change in season. Claire, how nice to hear from you, and thank you for letting me know that you enjoy the posts. I’ve been hearing from friends about the intense heat you’ve been having. It must be very trying, and I hope it changes for you soon. If you’d like to subscribe to the full newsletter, I sometimes send a special one to my northern hemisphere subscribers. You can sign up on the home page of my website or the pop up box on the blog.